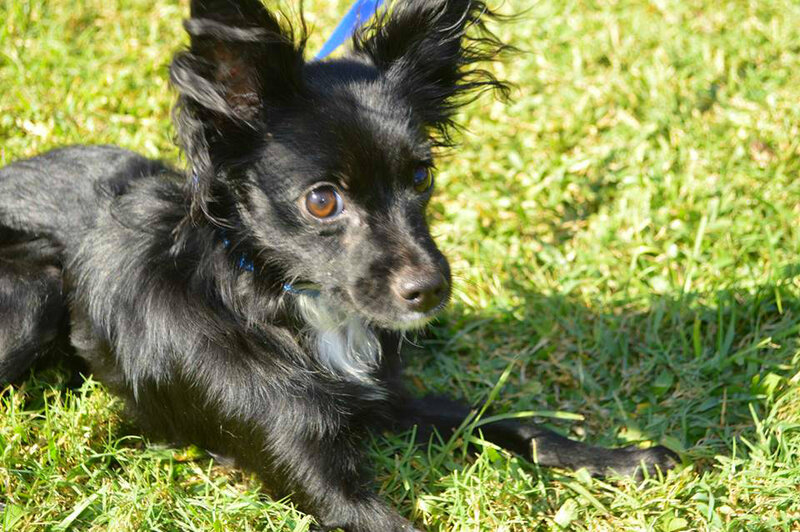 Cortez is one of three little Chihuahua/BC pups who just arrived at TDL. Their mom is a Chihuahua and their dad is Mr. Moonpie, the BC mix (recently adopted through us). Cortez is the most energetic of the 3 boys! Please keep an eye on our page for updates! If you’d like to be considered for one of these puppies, please go here to learn all about Our Adoption Process. We don’t use a traditional application, but we would like you to answer a few questions so we can get to know you better. Check out his Photos on Facebook! 8/27/2016 Update: Cortez found his family today! Craig and Ali of Orlando FLorida fell in love with this sweet boy. Congratulations to them all! 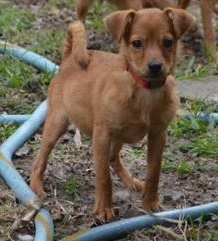 Tulio is one of three little Chihuahua/BC pups who just arrived at TDL. Their mom is a Chihuahua and their dad is Mr. Moonpie, the BC mix (recently adopted through us). Tulio is the most energetic of the 3 boys! 9/3/2016 Update: Tulio and Miguel were adopted by the Lyle family of Ponte Vedra Beach. They will be sharing their new home with human, dog, and cat siblings. A busy, happy home! 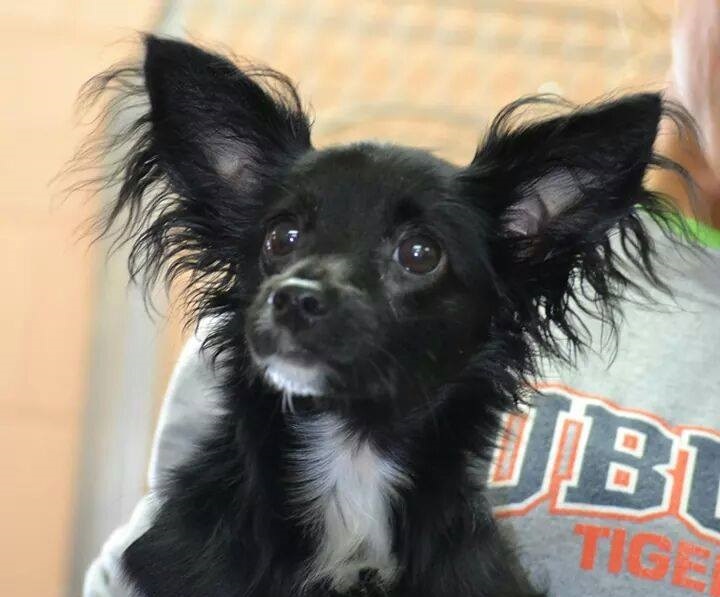 Miguel is one of three little Chihuahua/BC pups who just arrived at TDL. He is the smallest of the three pups. Their mom is a Chihuahua and their dad is Mr. Moonpie, the BC mix (recently adopted through us). Miguel is the smallest of the 3 pups but he is BIG on love. 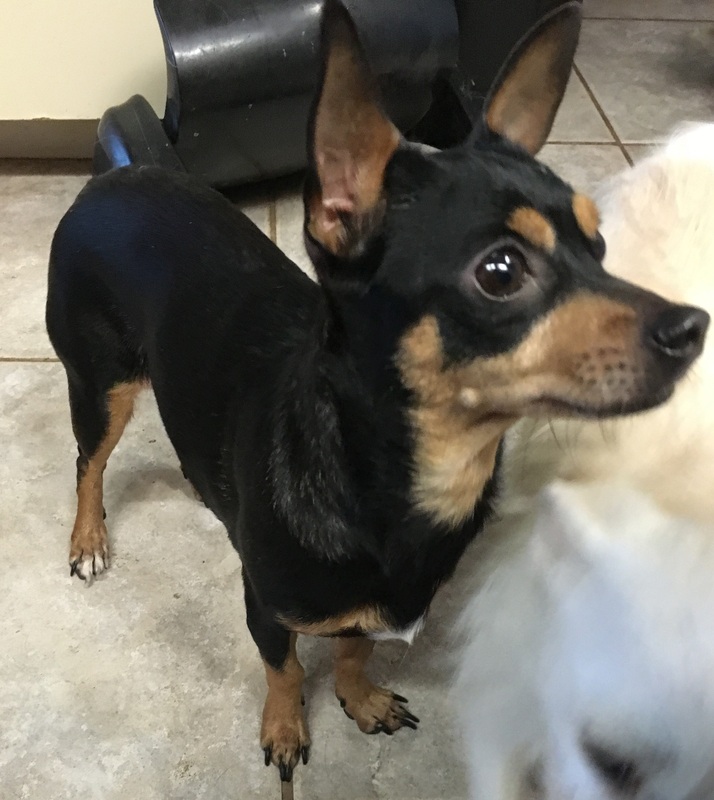 Roland is a 18 month old male chihuahua who came to us with Tiny Tina. We are still vetting and getting to know Roland, more information coming soon! If you would like to be considered for Roland please read Our Adoption Process and answer the questions presented in the article. Check out Roland’s Photos on Facebook! 4/23/16 Update: Roland, now King Tut was adopted by former TDL adopter Alisa (Captain Teemo’s mom) and Tut is already working as a therapy dog! He’s been visiting cancer patients, folks with depression, etc. We’re so very proud of him! 7/8/16 Update: Roland and Teemo now has a new sister. Welcome home Daphne! 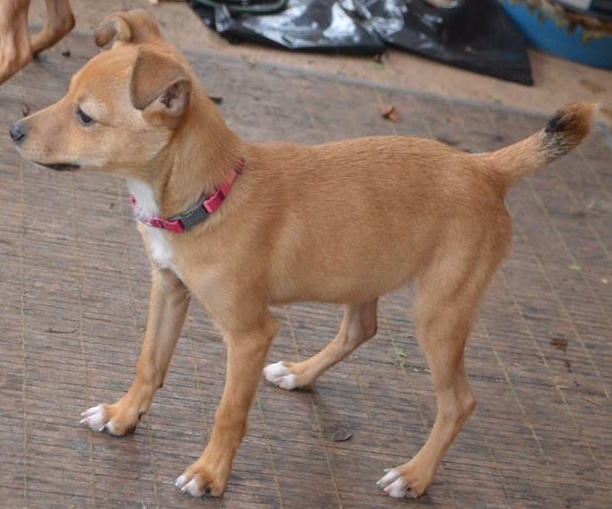 Tiny Tina is a 6 month old female chihuahua who came to us with Roland. 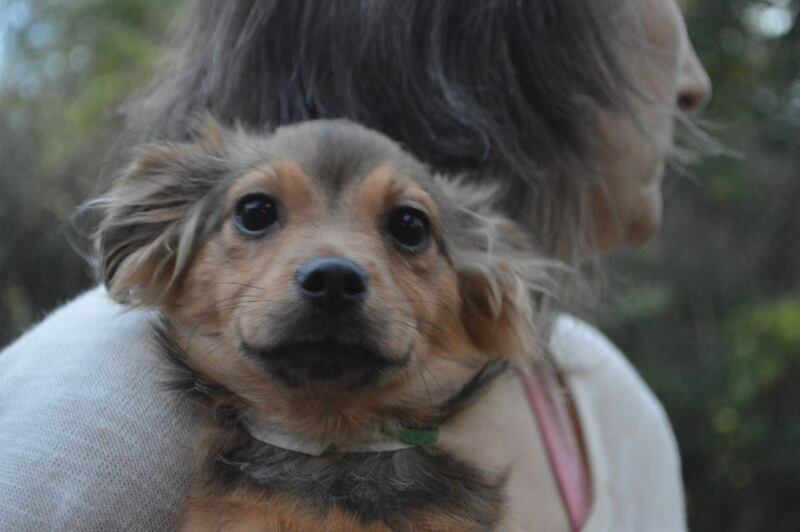 We are still vetting and getting to know Tiny Tina, more information coming soon! If you would like to be considered for Tiny Tina please read Our Adoption Process and answer the questions presented in the article. Check out Tiny Tina’s Photos on Facebook! 4/23/16 Update: Tina was adopted by Stephanie of Altamonte Springs! Minnie Mouse is on her way! 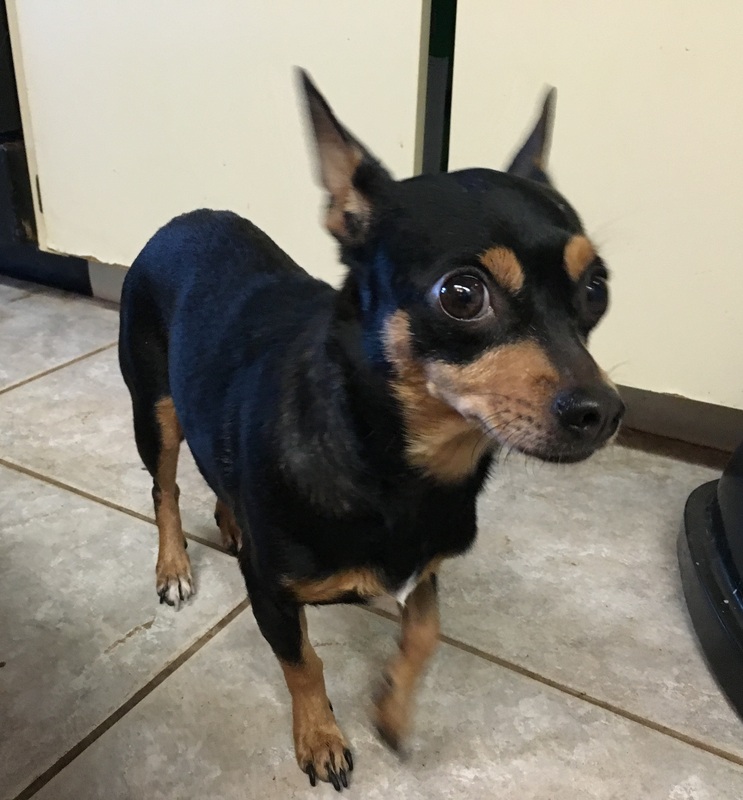 3/10/16 Update: Minnie is a 7 year old Chihuahua mix around 11 lbs. She fully vetted (including spay) and seeking a home. Minnie does have a special need, she is blind. She is also very loving! Check out her Photos on Facebook! If you are interested in being considered as an adopter for Minnie, please read Our Adoption Process and answer the questions in the post. 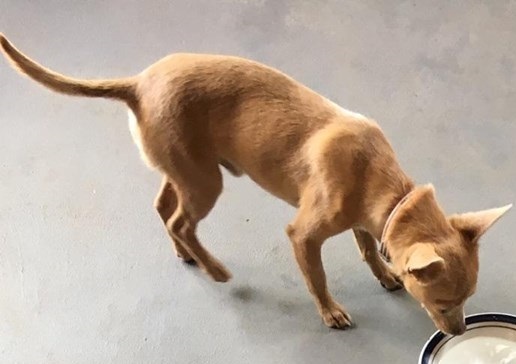 History: When Alyse brought this dog to my attention, she was hoping we would take her, but she was even more hopeful that we could get pledges/donations for her veterinary care. 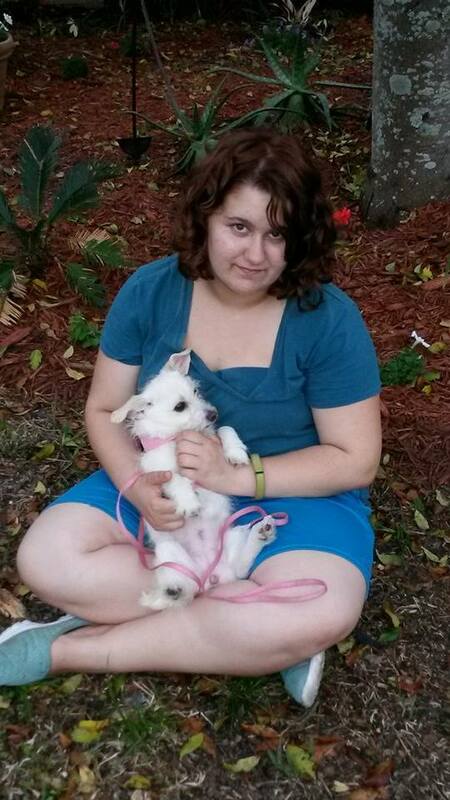 On the dog’s page via Rescue Me Tampa, she received quite a following! 108 Likes, 371 Shares, and almost 100 comments left by concerned individuals on Facebook. Yet, after Alyse asked for pledges – her page went silent! Minnie will need full blood work, and a dental which may include a few extractions. She will then need all of her vaccinations, her spay, and her microchip. She is heartworm negative! We will probably want her to have the spa treatment as well. A nice bath and some conditioner never hurt anyone! Please make a donation toward her care. 09/09/14: This little girl is coming to our rescue. She needs the works, not just spay. She has severe dental issues, and as you can see, we are hoping to get her into an eye specialist who can operate. We need your help! Please click http://thedogliberator.com/virtual-foster/ if you can sponsor her rescue.We want to thank our Alyse and Debbie from Hillsborough County for coordinating her rescue for us, and Theresa Lorenzi for offering to transport her tomorrow. 09/10/14: Thank you Theresa! Minnie is in the house! 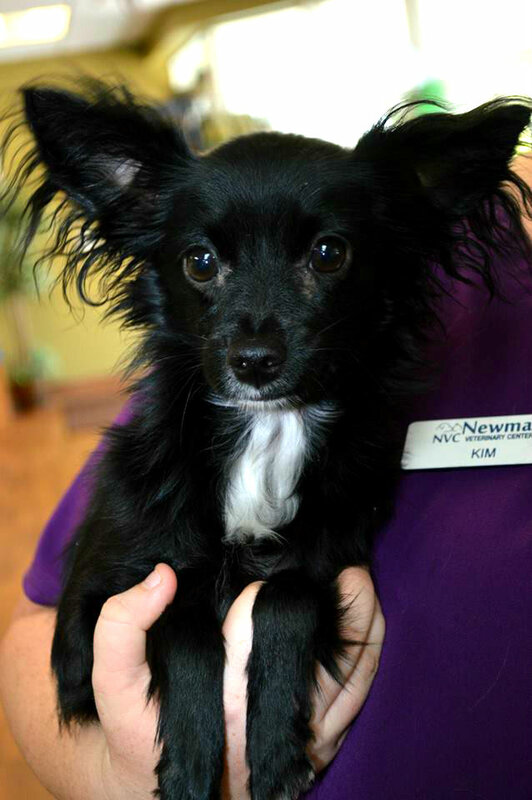 The staff at Newman Vet/Deltona just love her! She is scared to death but she will let you hold her – no problem! We have our work cut out for us. 09/11/14: Last night I was on the phone with Carrie of Newman on and off. We were coming up with a plan for this shy little girl we call Minnie Mouse. First, was the eye medication, next we discussed her spay surgery – so bloodwork was in order. I got comfortable and tried to watch the President’s address to the nation, when Carrie called me again, bloodwork is just fine! Woo Hoo! When I looked up at the TV, the Muppets were on… how did that happen? Carrie & Minnie after a bath! Note: I just want to pause here and make it very clear why I love Newman Vet so much… while we are just starting to relax after dinner, and prepare for bed, the staff at Newman are always taking care of our dogs – without delay. 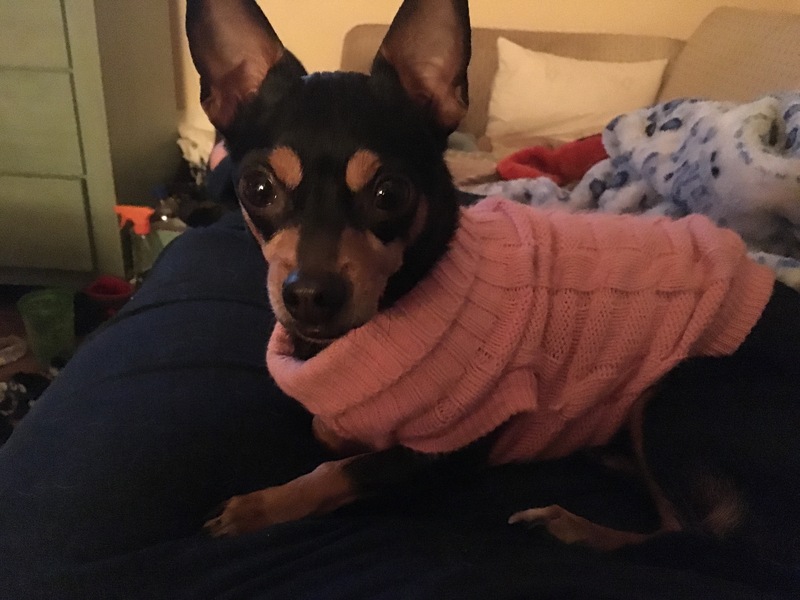 No Minnie didn’t have to wait for the morning… for someone to unlock the door, turn the lights on and check our our dogs… Minnie received care as soon as she arrived. And it’s not just medical care that they provide, the staff at Newman really pampers our rescued dogs with love and attention! I spent the rest of the evening texting Alyse about Minnie’s condition and prognosis. Minnie and Zsa Zsa have taught me a lot, and we have much to share. We are gathering information to write a post that we hope will help the welfare of all dogs. In the meantime, we still need donations for Minnie’s care, can you help? 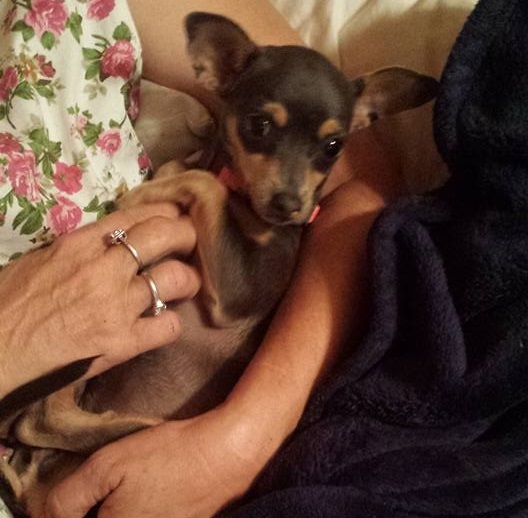 09/12/14 Update: Minnie had multiple teeth pulled yesterday, and a dental cleaning. The Vet tells me that many of her teeth were absolutely rotten. They couldn’t believe it. She is going to feel so much better now. She was also spayed. Out vet estimates she is around 8 years of age. 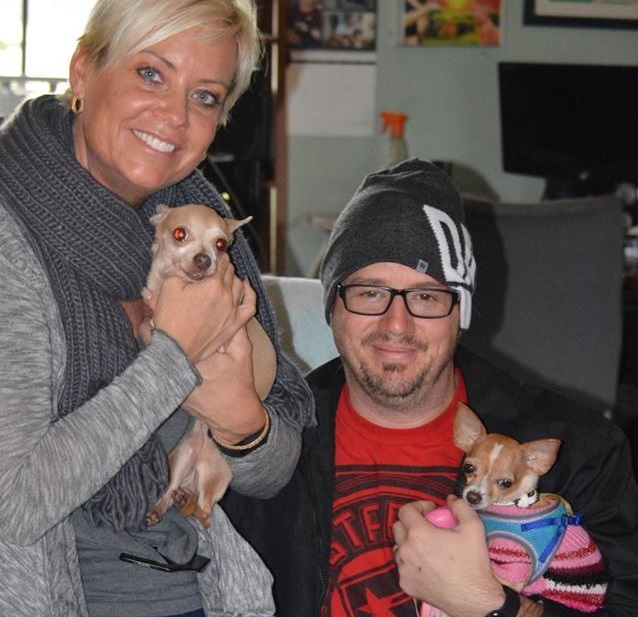 Shannon Adopted Minnie Mouse today… I’m still tearing up! 09/14/14 Update: If you have kids, you know the book series “If You Take Your Moose to the Movies“. Well, I believe if you leave a cute dog at the vet long enough, someone there will fall in love and adopt it! That’s what happened to Minnie Mouse! Everyone at Newman Vet just fell in love with this sweet little thing, and Shannon asked us this morning if she can bring her home. I Cried!!! Not just any Shannon, but my Shannon! We are so blessed to have so many wonderful and dedicated volunteers, and so blessed to have the best adopters – EVER! 09/25/14 Update:While Minnie Mouse has proven to be a wonderful little girl, Shannon had some bad news today. Shannon’s husband is very allergic to her, and that’s something that I totally understand. I am personally allergic to the smoothies, the short-haired dogs. Shannon thought since they have other breeds, the Chihuahua would be a no brainer, but the breed does have different hair than let’s say, the Maltese, etc. So Shannon is having to give up Minnie Mouse, and she is heart-broken. But the good news is we have learned a lot about Minnie, she is very affectionate, great with cats (they love her) and with kids. As much as we wish Shannon could keep her, we know we’ll find her a wonderful home soon! 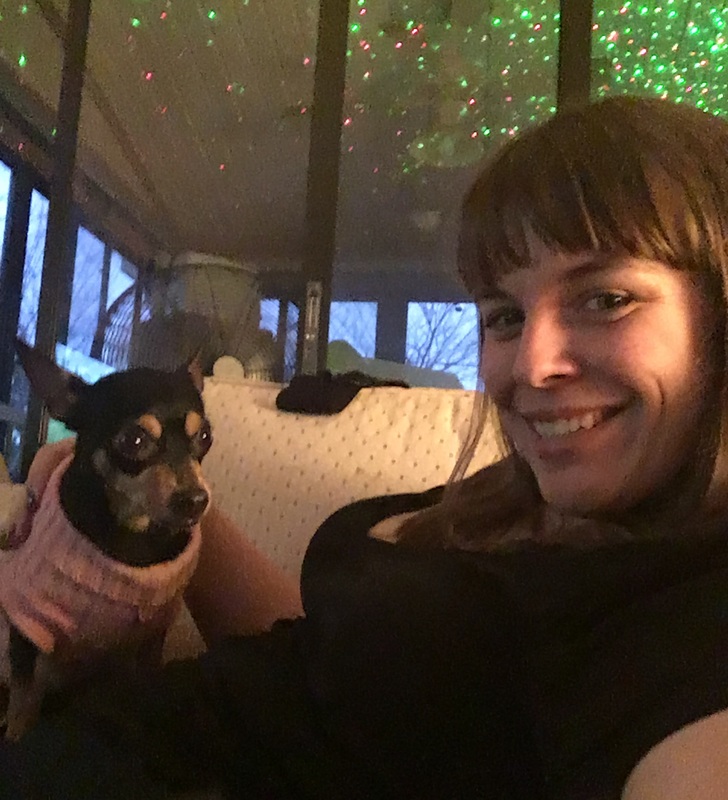 09/28/14 Update: After consulting with her family, Shannon is going to try some natural products and a few ideas to help her husband’s allergies with Minnie. I bought Minnie a super cute sweater today, which I know will keep the dander down to a mild roar. That along with baby wipes might help! We’ll have updates soon! 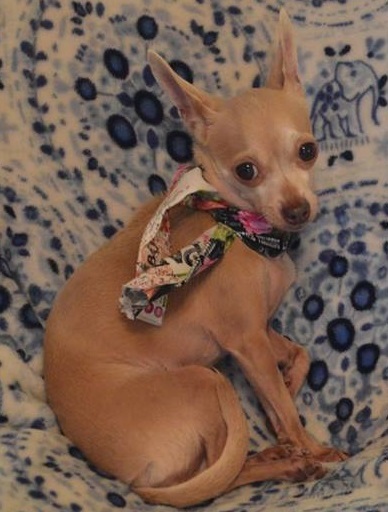 Tootsie is a 16 month old female chihuahua who comes to us after the death of her owner. Check out her Photos on Facebook! 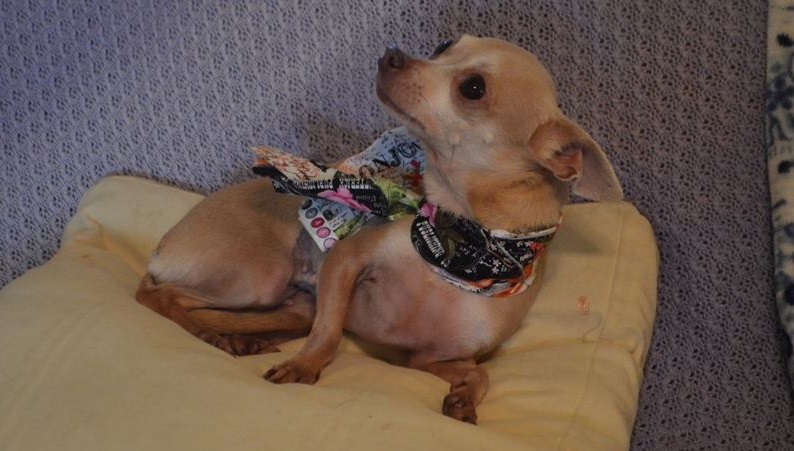 She is receiving medical care and is seeking a loving home! If you are interested in being considered for Tootsie please read Our Adoption Process, answer the questions presented in the article, and send your answers to the email listed in the post. During my visit to Florida for the TDL Reunion I had the opportunity to meet Tootsie. She is a beautiful Chihuahua with the most amazingly sweet eyes. When I walked in, she was scared. 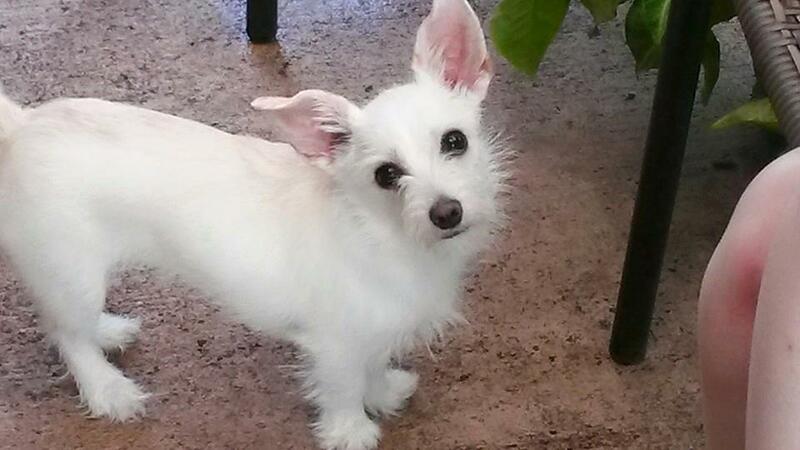 Tootsie hasn’t been socialized much, and she is initially afraid of anything new. She has already adjusted life in the TDL pack and grown comfortable, looking to Pink and Rosie for guidance at times when she is unsure. Initially would not walk near me, she barked, paced, and ran away. Night one she only approached me when the whole pack was getting cookies and she took one nibble and ran. In the morning Gisele put her on a leash and I walked her around. She is still adjusting to wearing a leash but adapted well and after a few minutes she barely noticed it. I took her outside in the yard to give her an incentive to like the leash. I sat down in a chair and offered her treats to come closer, sometimes with small leash cues, sometimes on her own. No sudden movements, low gentle voice, even my words were slow. She needs calm energy, and to know what is happening. Then when she would put her paws on my thigh to get a treat, I slowly moved to the floor and set the treats further across my legs so she had to walk on me to get it. I practiced putting an empty hand out, and holding a treat in the other so she would have to brush past my hand to get the food, initiating touch. We worked for probably 30 minutes, and it ended with her coming up with no leash tension and standing on my leg (hind legs on the ground). She would not let me touch her body bellow her head but would let me touch her ears. You have to move slowly, slowly, and let her see that you plan to touch her and where. Surprise will make her flee, and moving too fast will scare her. It is the unknown that sets off her anxiety. We resumed later that day when I sat in Gisele’s spot on the couch. No cookies, but she did hop up and sit with me. She wants affection, she just needs to know she can trust, and that you will respect her. At one point I did move too quickly and scared her. I would expect a fearful dog to bite me, but she nose bopped me instead. I think this shows her desire to trust you. By the end of the evening she was sitting on my lap, getting a massage and if I patted my chest she would come closer and even kissed me. After just a day and a half and she was on my lap, giving kisses. It is possible but you must go slow and show her “I don’t want to hurt you, I want to cuddle and give you nice things.” She will accept. The morning that I left Florida, I sat on the other couch and shared bits of my toast with the pack. Slowly, slowly Tootsie joined the fun, and when Rosie moved off of my lap she hopped up and curled up. The real gem of the day was when Gisele’s son Ryan came home. Tootsie had previously seemed to show more fear toward men than women. Not today. She allowed him to sit on the couch beside her, and slowly reach over and pet her. No sign of fear. Tootsie is learning bravery and trust, and is letting her amazing heart shine through. You may be wondering, why is all this worth it? Why would I want to deal with a skittish dog? What is the payoff? She is the payoff. You get Tootsie, a good girl who loves to cuddle and kiss. She is alert and will let you know if something is amiss in the house or outside. 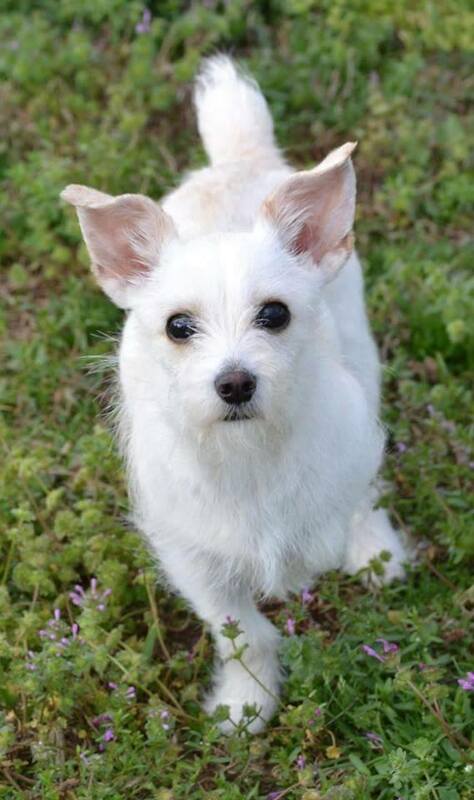 She is good with other dogs and would love to be your best little buddy. It doesn’t take long to build trust with her and she is worth every moment of it. 3/28/16 Update: Tootsie was adopted by Jessica of Deltona! Little Bowie is an 9 week old male Chihuahua/sheltie mix and is one of the 4 Bowie pups. Check out their Group Album on Facebook! 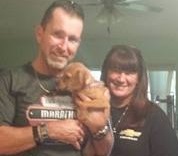 1/11/15 Update – Little Bowie was adopted by the La Torre’s of Ormond Beach! Woo hoo! Little Ziggy is an 9 week old male Chihuahua/sheltie mix and is one of the 4 Bowie pups. If you are interested in being considered for Little Ziggy please read Our Adoption Process, answer the questions presented in the article, and send your answers to the email listed in the post. 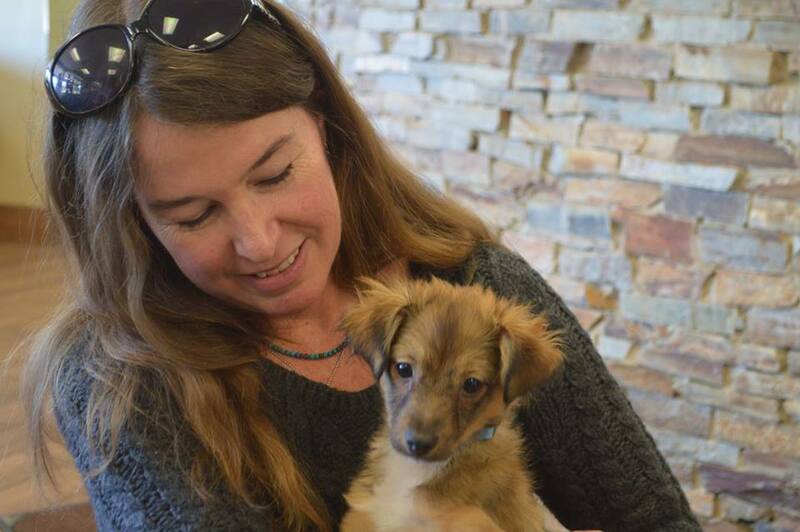 1/30/16 Update: Little Ziggy has been adopted by the Young family of Satellite Beach, FL! 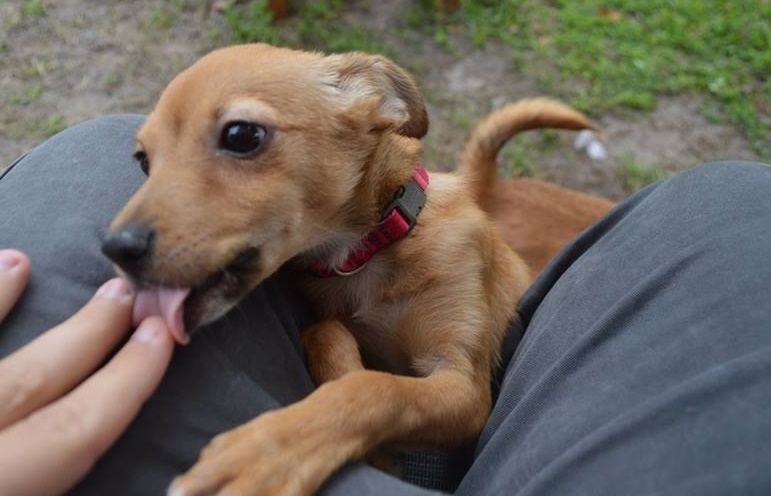 Major Tom is an 9 week old male Chihuahua/sheltie mix and is one of the 4 Bowie pups. If you are interested in being considered for Major Tom please read Our Adoption Process, answer the questions presented in the article, and send your answers to the email listed in the post. 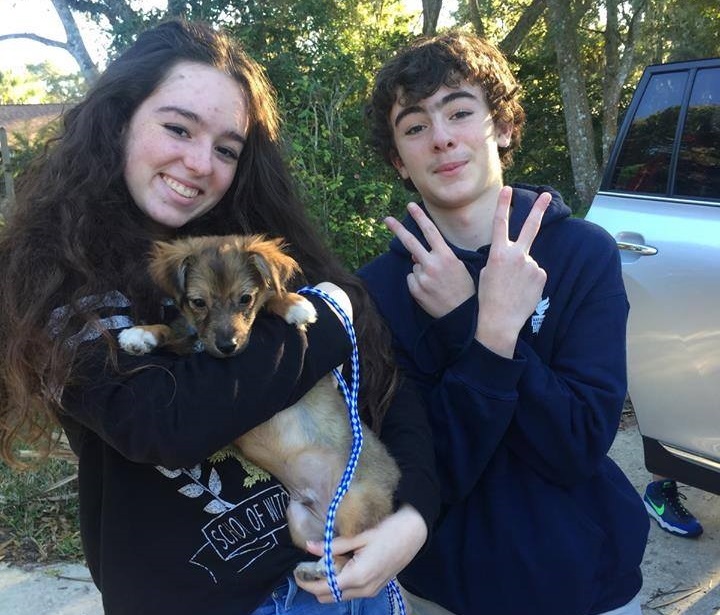 1/31/16 Update: Major Tom was adopted by the McDonnells of Daytona Beach! Congrats to you and your new family, little guy! Stardust is an 9 week old female Chihuahua/sheltie mix and is one of the 4 Bowie pups. If you are interested in being considered for Stardust please read Our Adoption Process, answer the questions presented in the article, and send your answers to the email listed in the post. 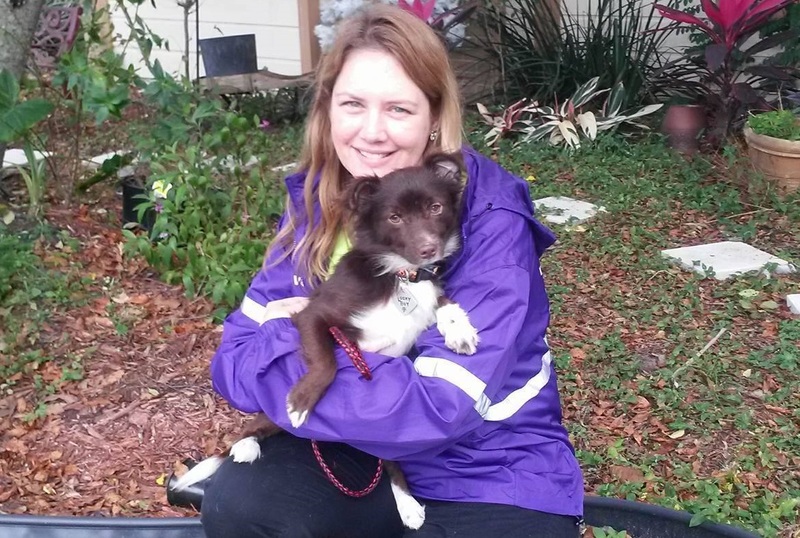 1/29/16 Update: Stardust was adopted by Sydney Flanigan of Coco Beach, FL. Congratulations to them both! 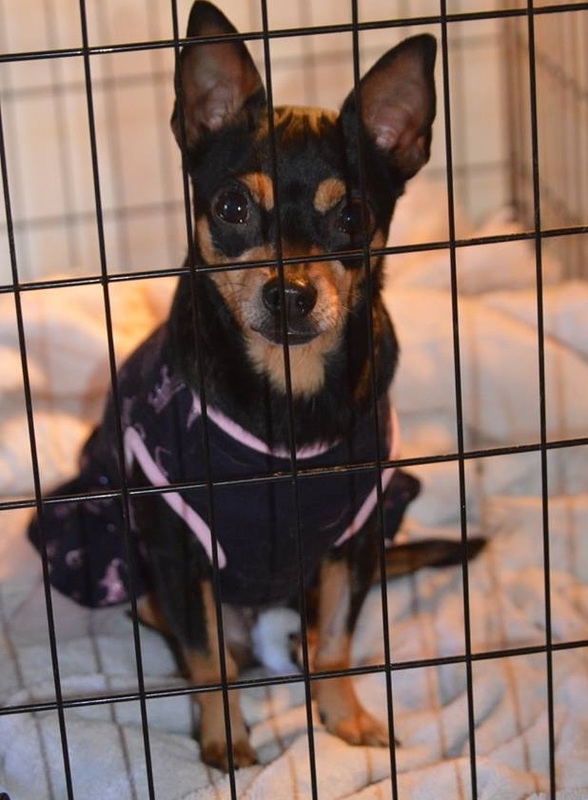 Tater Tot is about 1-2 years old chihuahua who comes to us after the loss of her owner. Check out her Photos on Facebook! She is receiving medical care and is seeking a loving home! If you are interested in being considered for Tater Tot please read Our Adoption Process, answer the questions presented in the article, and send your answers to the email listed in the post. 1/22/16 Update: Tater Tot was adopted by the Clevingers of Jacskonville. She has a new doggie sister, too. A Chihuahua named Zoey! Foo (Aka Mr. Foo Fighter) ~ Adopted! 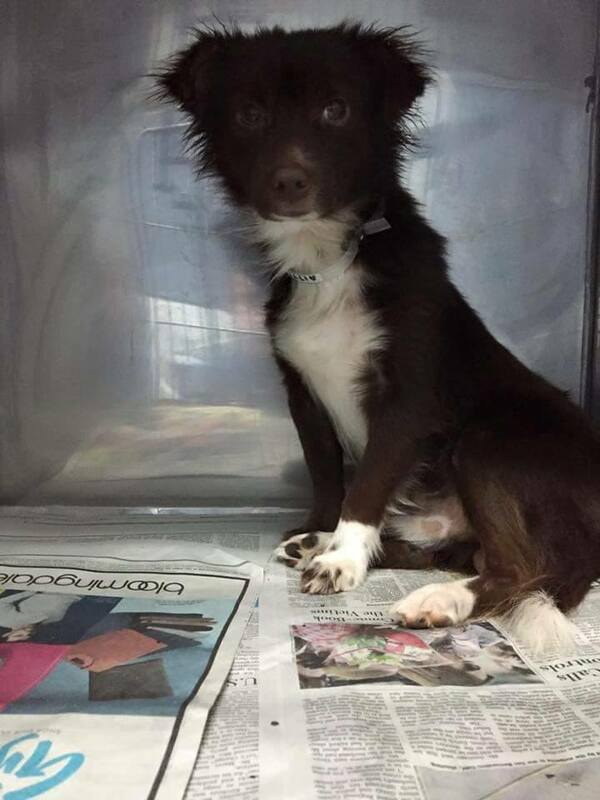 Foo is an 8 month old Border Collie mix (we think border collie chihuahua as he is currently less than 20 lbs). Life hasn’t been easy for little Foo. He has scabs from being eaten up by bugs and currently has a cough (he is being treated for both right now). Foo is scared. He wants to cuddle, wants to be your good boy, but is still learning it is okay to want all that, and that humans are nice and understanding. He is currently receiving lots of love, positive interactions, and some work on self-esteem. We expect to see him blossom quickly. If you are interested in adopting Foo please read Our Adoption Process for the next steps. 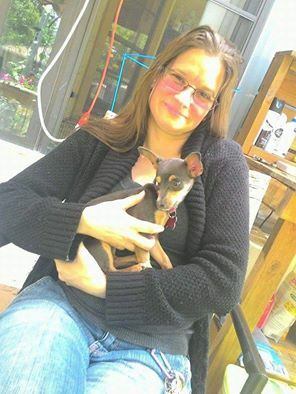 1/10/16 Update: Foo was adopted by TDL’s very own Michelle Kamber today! Congrats on your awesome new home, Foo!!! Little Vader may have the name of a villain but he is anything but! 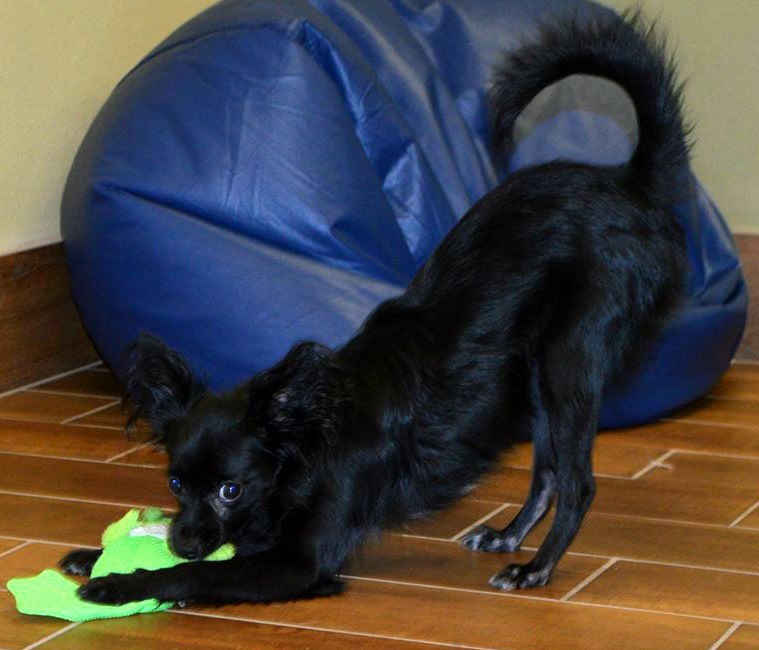 Vader is a 13 month male chihuahua, approximately 5 lbs, who is up to date on shots, neutered, and doing well! 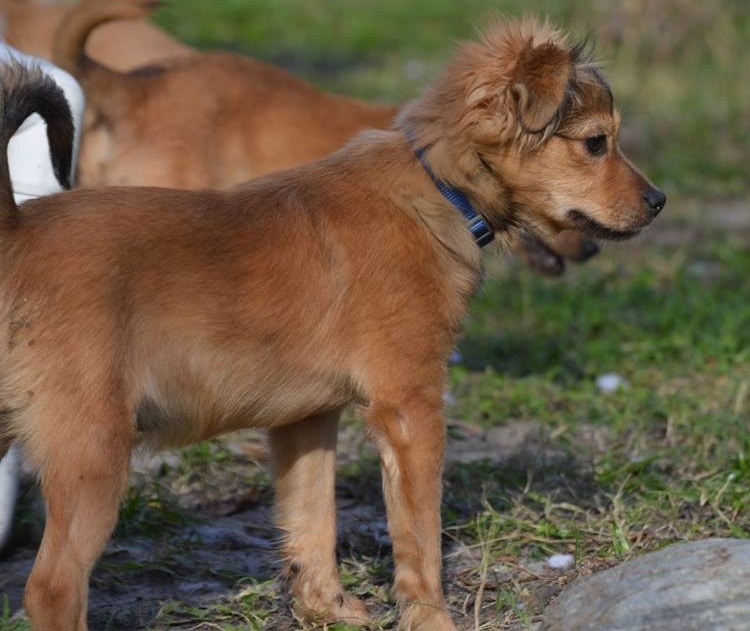 This spunky little fellow is great with other dogs and has done well with children. He is crate and leash trained and now just needs an awesome home! If you are interested in adopting Little Vader please read Our Adoption Process and email us with the answers presented in the article. Check out Little Vader’s photos on Facebook! 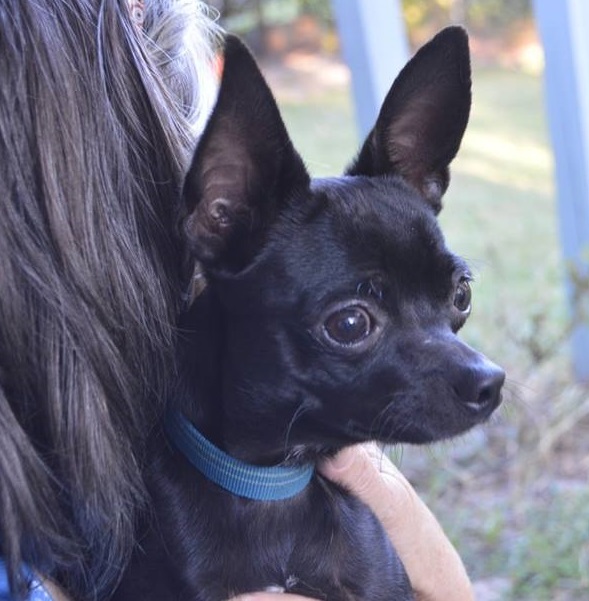 11/11/15 Update: Little Vader found his home with Dixie McCombs of Deltona, FL! More information coming soon! Have you met Rocky? He will be on his way to us shortly! We don’t know much about him yet but more information will be coming as soon as we have it for you! Here is what we do know. 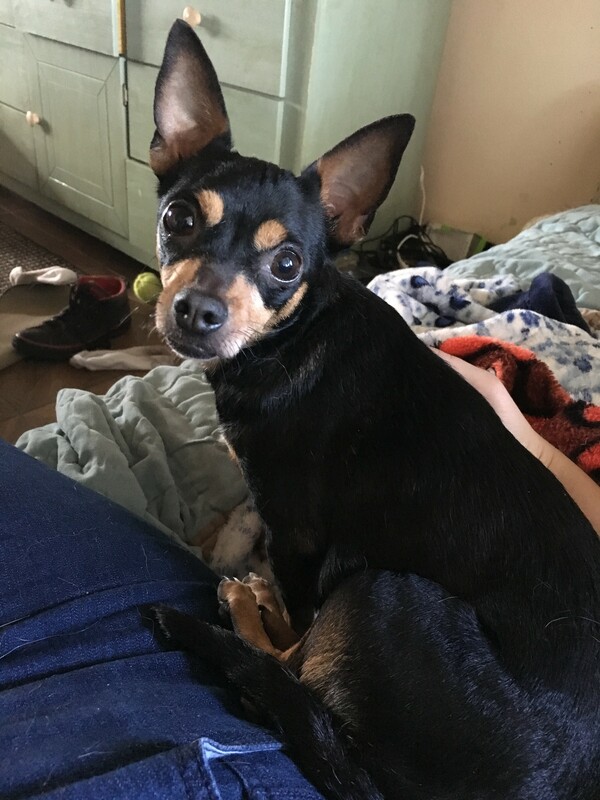 Rocky is a 2 year old, 10 lb male chihuahua mix. If you are interested in being considered for Rocky check out Our Adoption Process and send the answers to the questions. Rocky has found his place and his people! He just became the third member of Al and Ans’ TDL-filled pack! Lil Flash and Adam Levine will be his “big” brothers and his new name is Gizmo! Lil Flash, Adam Levine and Rocky, now Gizmo! Tickle Me P!nk (P!nk for short!) 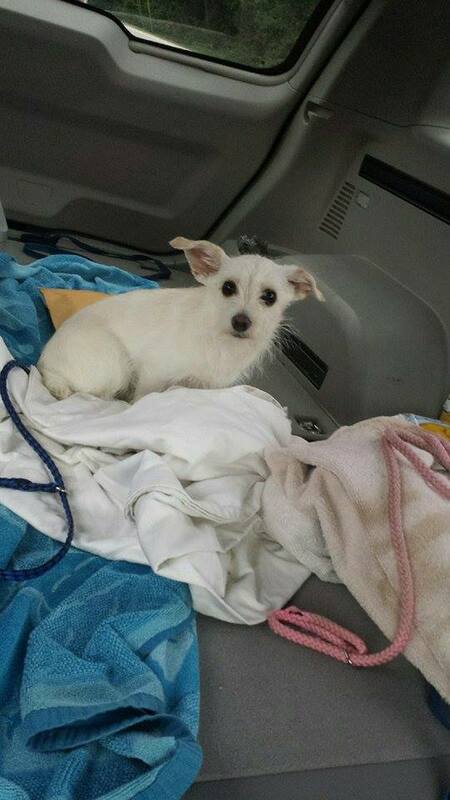 is an 8 month old female Chihuahua schnauzer mix who is a little shy but so hopeful. You can just see it in her eyes, a little timid but deeply desiring to fall head over paws in love with someone who will love her just as much in return. 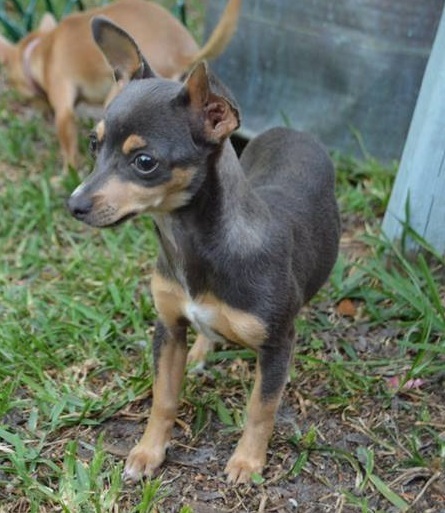 She comes to us as a stray and will be fostered in Deltona. We look forward to telling you all about P!nk as we get to know her. In the meantime, why not check out her Photos on Facebook? 4/19/15 Update: As we get to know P!nk we are discovering how sweet and special she is. We would love to find a home where she might be able to be a companion for a child with special needs, as she seems to have a temperament which would be great for such a child. Calm and quiet, she doesn’t cry when left. She loves to sleep in bed with you and recognizes the privilege. She remains in her little spot all night. Our only warning is that she is small and will escape through small holes in a fence, so the yard must be secure. 6/15/15 Update – Today I got the message I half knew was coming. P!NK has been home all along. She is Rosie’s new playmate and best friend, Di’s little buddy, and has made her self a permanent part of the pack. P!NK adopted herself out, and We couldn’t be more happy that this little stinker will be loved and cherished the rest of her days. 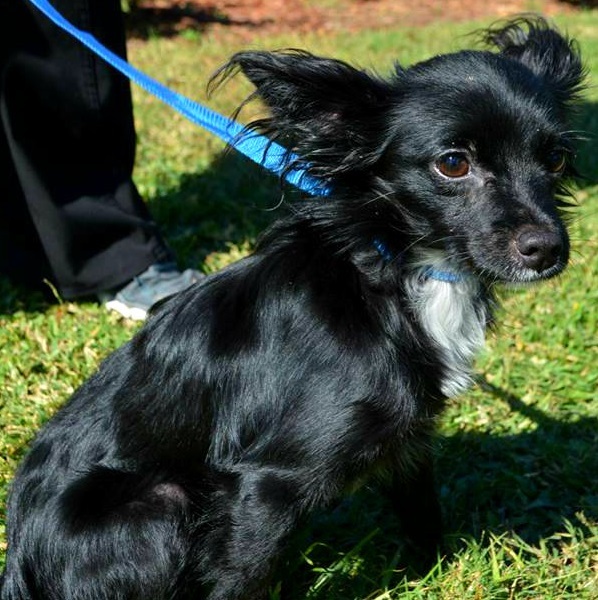 Viktor is a 6 month old male Long hair chihuahua. He reminds us of one of the faces of TDL, Rosie, and he is stinking cute! Needless to say Viktor is an attentive people pleaser and cuddle bug. He is not at all growly or snippy. In fact, the biggest issue you might have is him drowning you in kisses! See his photos on Facebook! 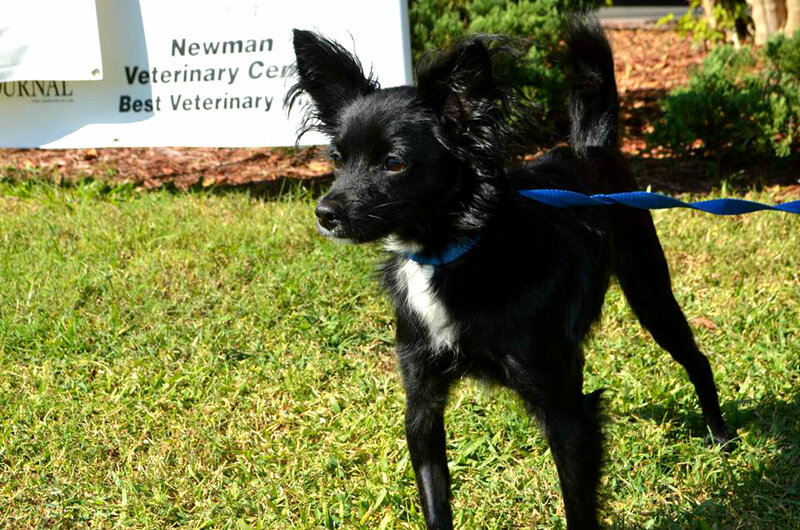 If you are looking for a pint sized companion, Viktor might be your little man! The first dog to start our #DogLiberatorChallenge is Rosie! Rosie steals all bones, toys and balls from all of our dogs. She piles them up on her bed, and the dogs don’t dare come near. We’ve even seen her approach one of our dogs, especially Ozzie, bark… to distract them, and steal their toy right from under their nose! Please visit #DogLiberatorChallenge for Details! Please Donate $10, and submit your photos or videos, and let the games begin. Visit the challengers Photos on Facebook! Close Your Eyes, Open Your Heart – How Do you Adopt Again After Your Dog Dies? How Do you Adopt Again After Your Dog Dies? There is a puppy mill that advertises they will create a special order Border Collie just for you. All you have to do is tell them what you want. The manner in which they can produce an identical replica of your deceased dog is frightening. For example, you can go so far as to request a red merle female with one brown eye and one marble eye – and they will produce it. 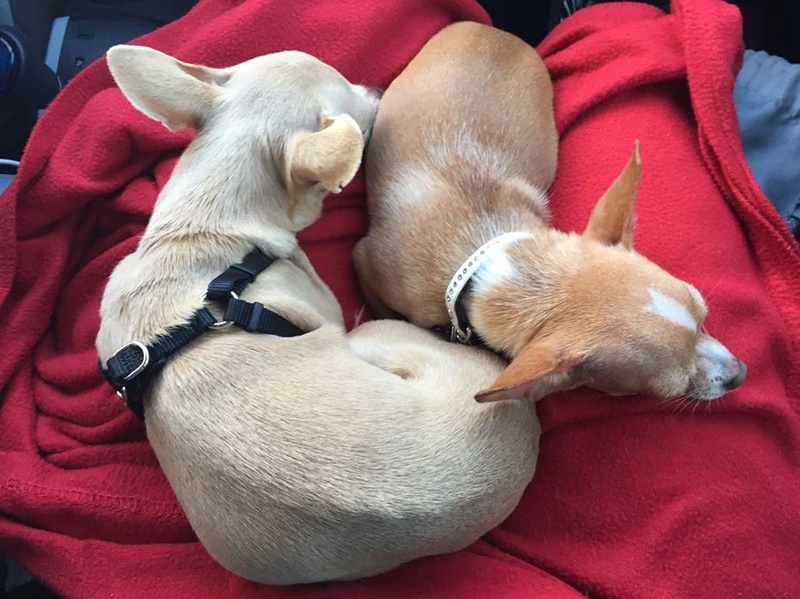 So what happens when you purchase a dog that looks identical to your dog that has passed way – will they be identical? I say no – it’s impossible. At least 50% of the emails we receive to adopt are from people who have recently lost their dog. The other 50% are from either people who want a second or third dog, or people who are ready to adopt their first dog. Many times, people who are grieving the loss of their dog are looking to adopt one exactly like the dog they lost. Maybe it’s a red merle Aussie female, or a classic black and white Border Collie. Throughout our interview process, I gather information about their home environment, their experience, the dogs they have had in the past, and I focus on recommending a dog that has the right temperament for them. Most of the time, adopters are wanting to adopt a dog they see in a photo. The problem with that is that they are completely overlooking the dog’s temperament. Many times, I am forced to recommend a dog that they did not notice, a dog that they did not look at, a dog that they are not interested in because… it doesn’t look like their dog that passed away. I totally understand this, because I did it too! In 1981, while living in Houston, a friend of mine found an abandoned litter of puppies under a shed at the Herman Park Medical Center’s rose garden. I took as many puppies as I could, found them good homes, and kept one, that I named Troubles. I didn’t know what breed she was, until I asked a friend, who without hesitation, said, “border collie”. I didn’t know what a Border Collie was at the time. I had Troubles until 1994, and she was amazing dog. Her focus was on me, and only me. She never took her eyes off of me, and did everything I asked. She was incredibly trained, yet she had no training. When Troubles died, I was a complete mess. Back then, there was no email, no internet, no cell phones. I faxed flyers to local humane societies asking them to help me find a dog just like her. My faxes went unanswered. 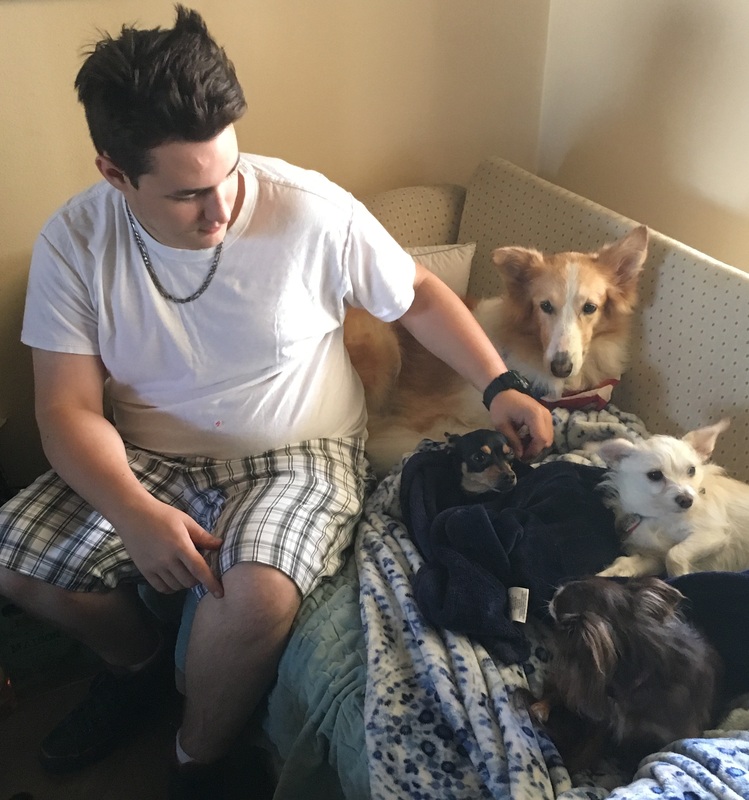 I visited a local Border Collie rescue, and met dozens of border collies, all of them unhealthy, and unbelievably hyper to the point that they were insane hyper. I looked around at other border collies on the property that appeared to have great health and great temperaments, and asked if I could adopt one of them. The answer was, “no, that one is mine.” After pointing dogs that was I interested in, I learned that they were all owned by the rescue. How many dogs can one person possibly own? 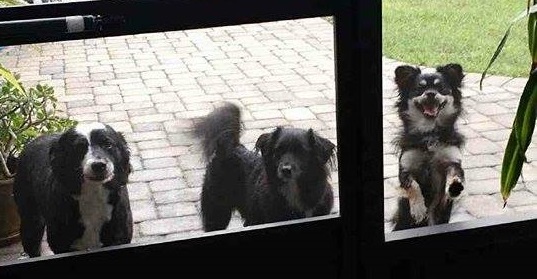 I left without a dog, and going home to an empty house was brutal. After a few more days had passed, my grief did not subside one bit. I even asked to take on projects at work that would cause me to work overtime. I wanted to avoid going home. After seeing my despair, my then husband took it up on himself to look in the local paper, and there it was! An ad for Border Collie puppies. He called them, and there was one female left. She was expensive, $450. We didn’t have that much money, but somehow we would manage our bills, and go without a few things for a while! Can I Replace My Dog That Just Passed Away? When I arrived I had the luxury of meeting the puppies parents, and the female mommy was a real love. I went to their back porch and met the baby female. There she was hiding under a chair. She was gorgeous. We brought her home and we named her Reckless. Reckless quickly became my third heart dog. First was my Collie, Nelson when I was just a kid, my Troubles, and now Reckless. Much to my surprise, Reckless was nothing like Troubles. So even though my goal was to replace Troubles, and I did get another Border Collie – the two were as opposite as day and night. Troubles was anti-social and a one-person dog, Reckless loved the world, and wanted to visit people! Many times Reckless was sneak off and visit a neighbor and just hang out. Neighbors would knock on my door and ask if they could take Reckless on their walk. Reckless was a social butterfly. Let me explain it this way. You may have a family of four children, and they even look alike, but one is a Saint, one is a Trouble-Maker, one may be a Scholar, and one may be a Drop-Out! Dogs may be similar, but even siblings are different. We see it all the time when we rescue a litter! Reckless died in 2009, and for the next few months I knew that I was incredibly lucky and grateful to have had three heart dogs in my life. I figured – this is it, I can’t possibly be blessed again. Ozzie was owner-surrendered, and while he is a purebred Border Collie, and a very good boy, he’s not my heart dog. Many other dogs found their way into my home, and The Dog Liberator was born. Finding great homes for great dogs was easy for me, and even though many of them reminded me of Nelson, Troubles, and Reckless – I did not keep! Why would I keep a dog for myself and rob a family of having the experience that I had. I came so close to keeping great dogs like Trixie Belle, Tim Tebow, and Jake. The temptation was unbearable, especially when I had two young kids constantly asking me, “can we keep them?” Oy vey! Several months had passed, and I rescued Lady Di and Goldie Hawn. I expected to keep Goldie, but she passed away. I eventually kept Lady Di, and she is amazing. I really thought that she would be as close as I could get to having a fourth heart dog, but I was wrong. I didn’t keep Ozzie and Lady Di technically for myself or my family, I kept them because they created a fantastic pack environment. Ozzie is the walmart greeter, and Lady Di is the sheriff! Months later, we rescued China, and against my will, we kept her as well. The bond between China and my daughter was too great to break. China fit into the pack taking on the roll as the cautious player. China had another purpose to serve. Her job is to be the Deaf/Blind icon of our rescue. She has served her role very well, because of her work at representing deaf and blind dogs, we have been able to rescue and adopt dozens of dogs like her. She has been the reason for Deaf Dogs Hear with Their Hearts, and The Chosen Ones. These three gorgeous dogs have been helping me rehabilitate and resocialize rescued dogs for almost five years now, and they do a fantastic job. I couldn’t rescue without them, for it takes years for a human to teach a dog what another dog can teach them in five minutes. This past January, I received a phone call from Lily’s Dad, Dusty. 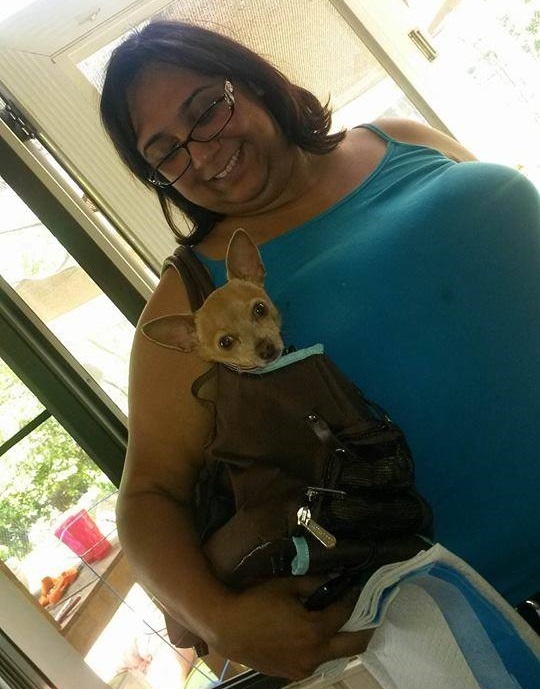 Dusty’s friend had to surrender her 2 year-old Chihuahua. Seriously? 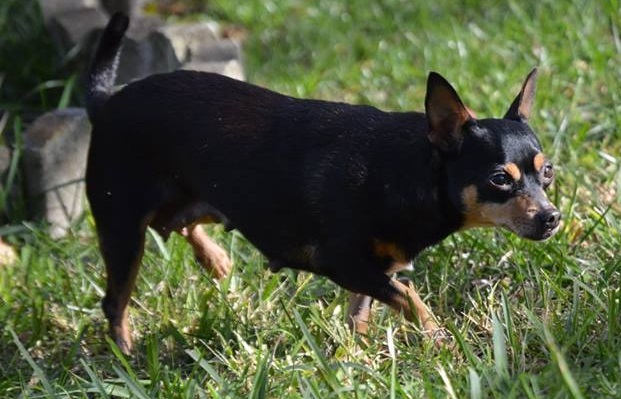 What am I going to do with a Chihuahua – one of the breeds I dislike the most. Dusty begged, and I had no choice but to say yes. 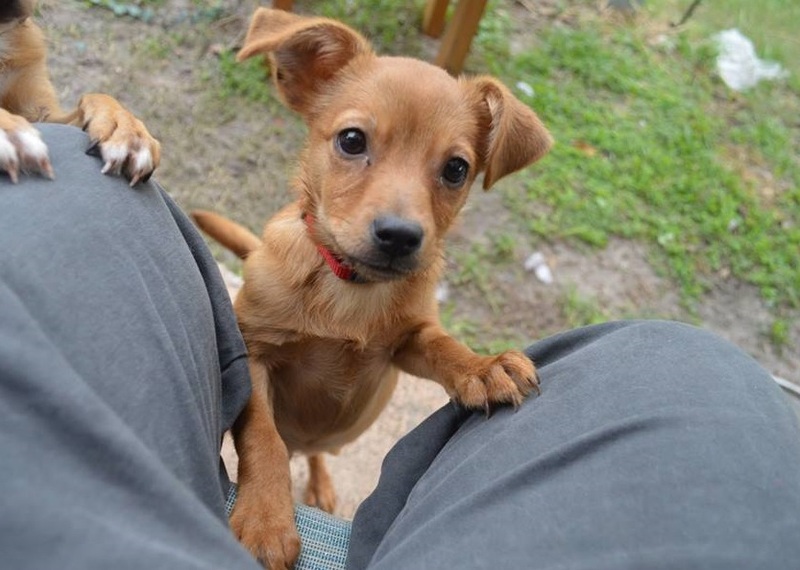 When that little red cutie pie entered my home and sat in my lap I knew I was in trouble. She won me over in less than five minutes, her name was Athena, but we named her Rosie. Later, when I picked up my children from school, they both screamed, “can we keep her?” Thank God they felt the same way I did. It has been four years since I have said yes to the word Keep! Rosie doesn’t really have a job here with our rescue, other than to represent her breed, which unfortunately is probably one of the most homeless and desperate breeds there are right now in our country. No one can resist Rosie! 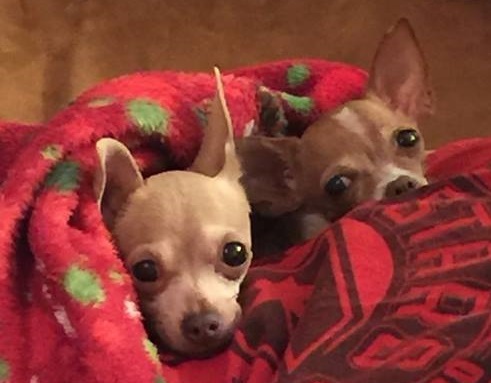 In 2007 only 800 Chihuahuas were homeless on Petfinder. 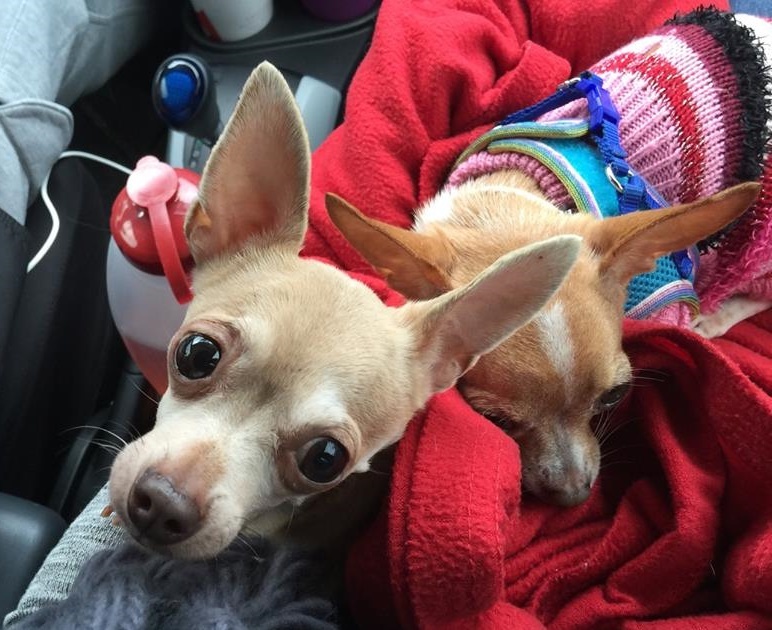 Today there are over 18,000 homeless Chihuahuas. If there ever was a breed that people should be trying to adopt, it’s the Chihuahua. That’s not the only reason why I was so excited to keep her. Ozzie is now 7 years-old, Lady Di is estimated to be about 6 years-old. We believe China is approximately five years-old. Their life-span is estimated to be approximately 13. Combine that with I’m getting older too (yes, I sing Stevie Nick’s Landslide often). My hopes are that as I am forced to say goodbye to each of these amazing dogs, I’ll have my Rosie to console me. Rosie has been part of our pack now for 7 months now, and she is my new Heart Dog! She barks when she hears even the slightest noise, she steals toys and bones from every dog every chance she gets. Rosie, we can take her everywhere! She serves absolutely no purpose here except to make us laugh and give us unconditional love. She will rub her little face on yours and make funny grunting noises expressing her deep love for us. She’ll sleep with anyone, anywhere if you let her. 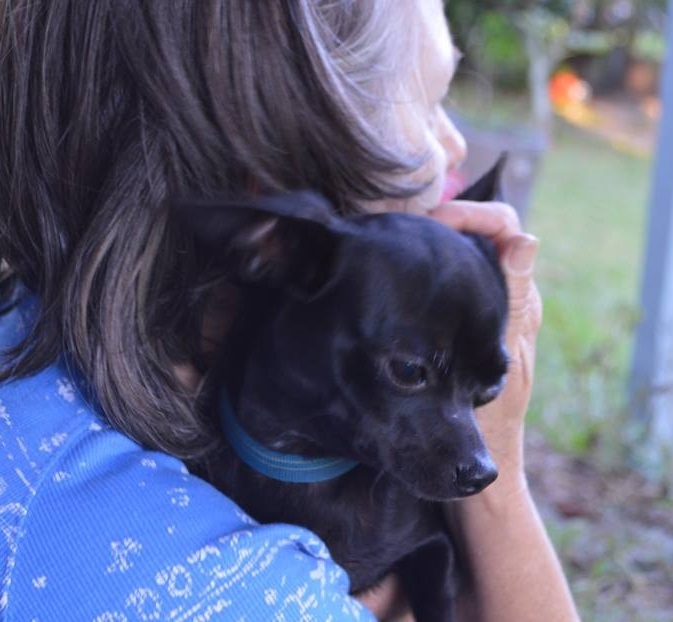 She is the most wonderful dog I have ever known… and she is a Chihuahua! My decision to keep her did not go without ridicule and sarcasm. People who know me took advantage of embarrassing me with comments like, “excuse me but that doesn’t look at all like a Border Collie.” I took the sarcasm with grace, and watched how each and every one of my friends couldn’t help but hold her… knowing that they wanted one too! 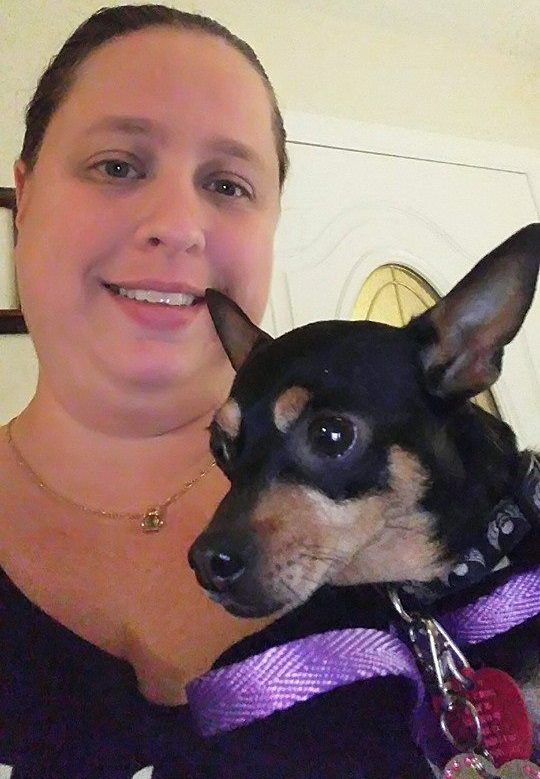 Recently, former adopter, Dianna Noreen found her own Rosie, and named him Chi Chi – now that’s one lucky dog, and one less Chihuahua on death row. While I’ve had nothing but collies all of my life, Rosie taught me a valuable lesson. Close your eyes, and open your heart. You never know what dog will bring you the joy you’ve been missing. Update: Just as I finish writing this, I received a text message from our Brittney, that Laddie passed away this morning. For those of you who attended our reunion last year, you’ll remember laddie, a big gorgeous Collie that was surrendered to us. It wasn’t until after Brittney decided to keep him, she learned from her vet that he had a stage 3 heart murmur. Laddie died in his sleep. He enjoyed the company of Brittney’s family, adored her young son, and enjoyed playing with this new pack. He died knowing love, family, and companionship. Ironically, the first thing Brittney’s sun asked her is, “can you find us another one?” Unfortunately, the answer is no. Every dog is unique, as unique as each of us are. Aye Chihuahua! This little boy arrived last Saturday, and he too was adopted quickly, by Kristina who works at Newman Veterinary Centers of Deltona! He is a wonderful little dog!